Hello everyone!! Hope all is well with you, today!!! I have been playing inside the last couple of days because the temps are close to 100....July is here with a bang!!! I have been working on a felt scene that fits into a frame...it will go into my *girls* guest room. Taylored Expressions has lots of new felt colors...I used several on my project today along with lots of Taylored Expressions dies. The TE Build a Scene Sunshine, Swirly Clouds, and Rolling Hills were all used along with Bloom Where You're Planted die set and the In Flight Overlays. Sewing was done on the hills and flower pot edge.....a piece of patterned paper was used for the sky and the pearls, button, and hemp cording finish it off. Thanks for visiting today...hope you find time to get crafty and stay cool!!! You've created such a cute scene with all the felt. Love it. 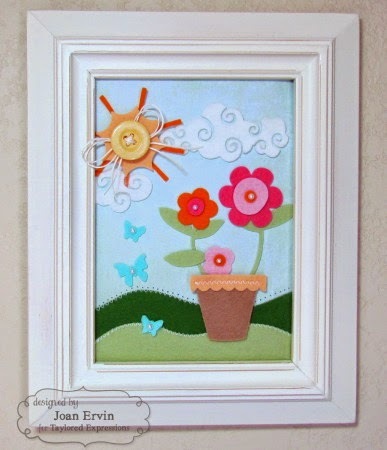 What an awesome piece of framed art you created here, Joan! I love the beautiful felt pieces, outstanding!! 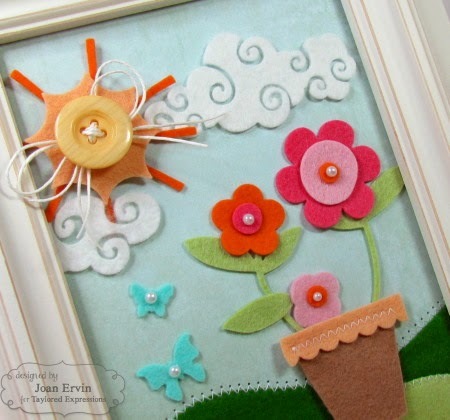 aww what a cute frame..love how you used felt..
Now that is just cute as can be Joan. Terrific picture in felt, wouldn't that be wonderful for a little girls, or big girl's room! Love this awesome framed felt art, Joan! What a delightful creation!! Oh, this is fantastic Joan. Love the scene and the different die-cuts you used... the felt pieces look awesome. All I can say is wow, Joan! The whole scene is beautiful right down to the sewn hills!! I love every creative inch!! Hope you have a lovely weekend !! Cute cute scence for your "girls" room. Love the rolling hills and those fancy clouds. this is so adorable! Love how you used the felt. Wow! What a wonderful summer creation! 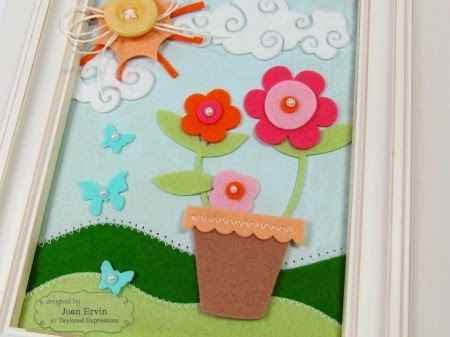 Fab dimension using those awesome dies, felt, and stitching!